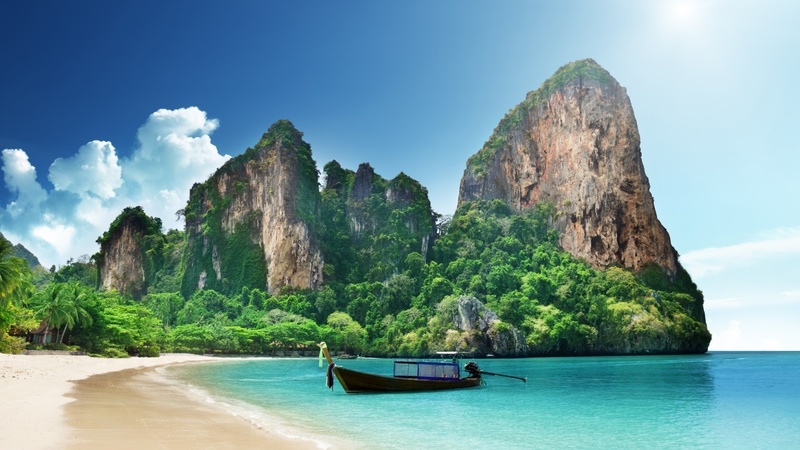 Thailand, known affectionately as the Land of Smiles, continues to be an ever popular holiday destination for those seeking an idyllic tropical destination. Famous for its rich and colourful culture, world renowned hospitality, delicious food, diverse entertainments attractions, exotic monuments demonstrating a high level of craftsmanship, colourful religious festivals and stunning beaches covered with fine white sand and crystal clear turquoise seas. It is easy to see why it draws millions of visitors each year. As a precious pearl framed by crystal clear waters of the Andaman Sea, Phuket possesses the charm of untouched beauty. Blessed with white sand, palm-fringed beaches, lush green foliage of forested mountains, lovely waterfalls that cascade over massive granite boulders. All of this incredible scenery gives the island its special place among the worlds finest natural settings. Whether you wish to have a rest from the frantic pace of every day life and laze on one of the white sandy beaches or plunge into adventure, excitement or the hedonistic nightlife, the island of Phuket is an place where everyone will find what they are seeking making it a popular tourist destination. Phuket has much more to offer than just its palm fringed beaches although they are enough to lure tourists by themselves with their golden sandy beaches and crystal clear waters. There is a rich culture and many beautiful golden temples to explore although a whole array of options are available to tourists to the island. Patong is well known for its colourful and lively nightlife with live music discothèques, shows, bars and night clubs. The fresh seafood and local cuisines are delicious although for those that are less adventurous whatever ones culinary disposition, there is a restaurant catering to it. Shopping opportunities appear to be endless with a wide range of market stalls selling local crafts and several shopping malls with international leading brands. Golf - A golfers paradise, year round warm weather and breathtaking back drops. Spa - Indulgence yourself and restore your inner balance. Diving - Explore the aquatic delights of the Andaman Sea. Water sports - Sailing, sea canoe, jet ski and more. Dining - Sample delicious and very affordable Thai & International cuisine. Phuket FantaSea Show - the Las Vegas style theatrical performance. Night Life - A wide variety of clubs, bars and eyebrow raising shows. Shopping - Local crafts and international brands. From the moment you arrive at the airport it is clear that you are in a tropical paradise, a destination where one can restore their natural balance away from the hustle and bustle of everyday life. A stay here would present the perfect opportunity to visit one of the many spas on the island and enjoy being pampered from head to toe and to experience a traditional Thai massage. Here you can enjoy some of the most scenic and unspoiled beaches in the world. Samui's best beaches line the northern and eastern coasts, the most popular being Chaweng and Lamai, as well as Choeng Mon in the north. The waters offer superb diving conditions where you can swim amongst the colourful corals and aquatic wildlife with experienced diver instructors. Visit Big Buddha statue religious icon. Elephant trekking - what better way to explore the tropical island. Mum and Dad Rock statues - nature coupled with local folk law. Na Muang Waterfall - the cascading water is a popular tourist spot. Dining - Beach front dining at sunset makes for a perfect end to the day.